An ETF, or exchange traded fund, is a marketable security that tracks an index, a commodity, bonds, or a basket of assets like an index fund. Unlike mutual funds, an ETF trades like a common stock on a stock exchange. ETFs experience price changes throughout the day as they are bought and sold. ETFs typically have higher daily liquidity and lower fees than mutual fund shares, making them an attractive alternative for individual investors. Because it trades like a stock, an ETF does not have its net asset value (NAV) calculated once at the end of every day like a mutual fund does. After she died I became the executor of her estate and for the first time saw the results of 50 years of investing in only dividend paying stocks. Her returns were stunning. She was not a financial advisor but she believed in the principle that you should get paid while you wait. To her a stock that did not pay a dividend was simply a speculation not an investment because you could only make money if the stock went up. Dividends assured her of income and she would only spend that. 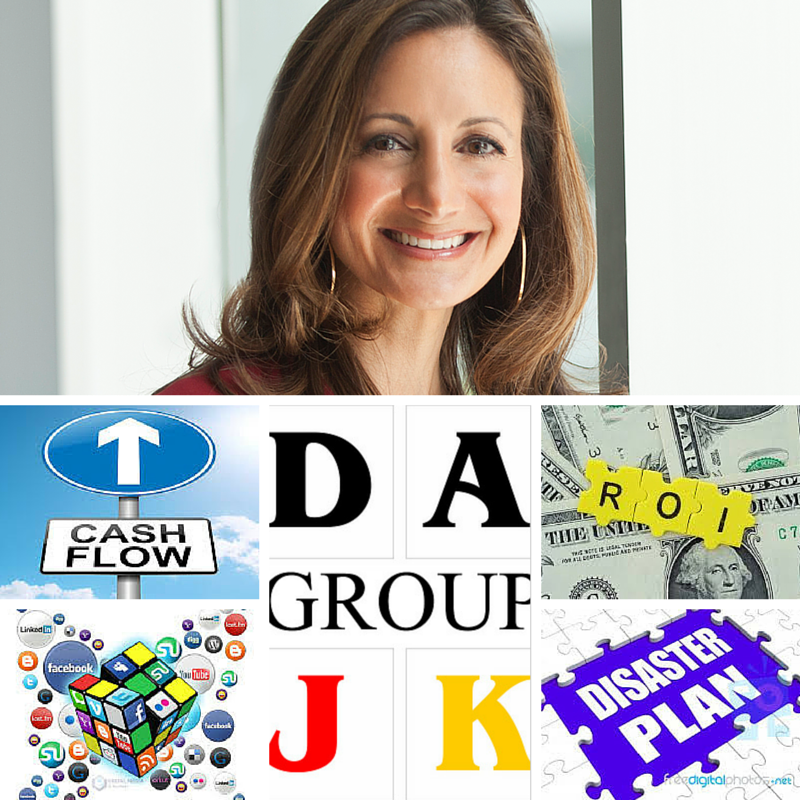 Seeing the results of her philosophy changed my mind about investing forever. I did some research. Did you know that over the last 40 years over 70% of the markets return came from dividends, not capital appreciation? That settled it for me, today I never invest in stocks that don’t pay dividends. Thank you for sharing your story regarding your mother’s investment philosophy. Investor only requires to master few investment principles/strategies so that he can invest money on his own without a financial advisor. Of course, he needs to a) search and select right dividend paying stocks; 2) strategize for a long term objective is 40 to 50 years. A similarity with your mother’s investment philosophy, our Net Lease Strategy has 4 similar characteristics and 4 distinct and unique advantages over dividend-paying stocks. The investor in Net Lease property (“Net Lease” or ”NNN”) also requires to master top six (6) net lease terms. The investor also requires to research, analyze, due diligence and review his acquisition. Since lease agreement is guaranteed by a tenant, therefore, tenant’s net worth must be at $US 100+ million in last 12 months. For example, it describes in details in Case Study Family Dollar. The investor in Net Lease also receives his monthly fixed income, called capitalization rate or short for CAP rate or just CAP. In fact, if net lease properties cannot pay CAP (positive cash flow at closing), it just a speculation. The investor in Net Lease property understands and seeks for long-term investment objective. It is a minimum of 5 years for Net Lease. Investor’s monthly income is a passive income, which taxed at lower tax rate than the earn income. The investor in NNN can leverage using mortgages or OPM if he wants to. This is a great option. The investor in Net Lease can purchase insurance against his underlined net lease property. This is a requirement for protecting his funds. In contrast, you cannot buy insurance against dividend-paying stocks. The investor in NNN has full control of his investment. He can re-fi with cash out, cross collateral, sell and lease back or SLB, sell with seller finance or wrap-mortgage. 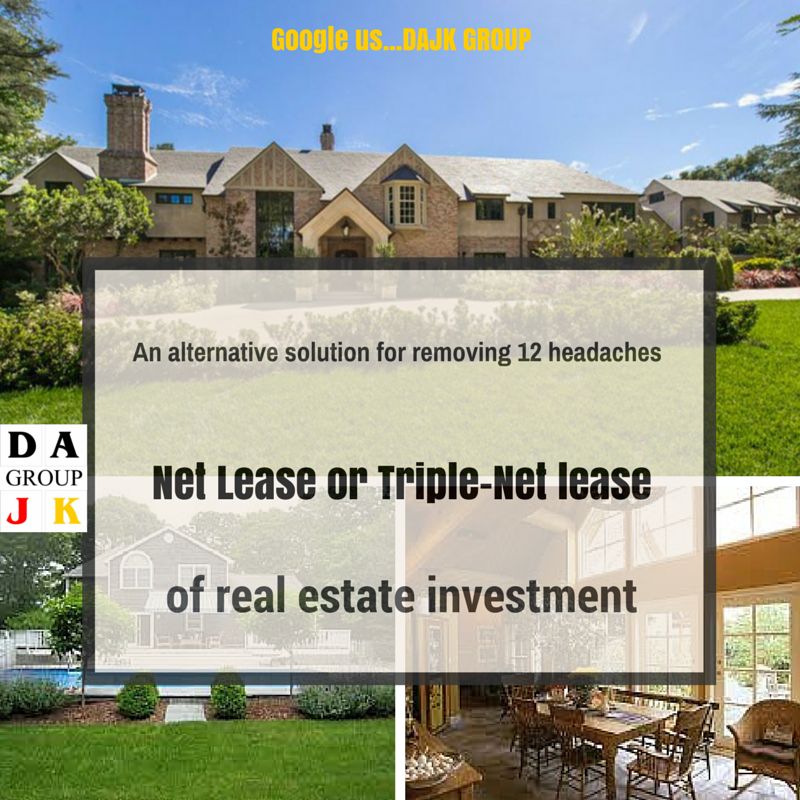 Additional of the net lease can be found at http://www.dajkgroup.com/net-lease-investment.html. It is including case studies and our monthly selections. Your Shark Tank’s episodes are always enjoyable, entertaining and packed of valuable investment strategy and creative structured finance. First Key selection of net lease Commercial Real Estate investment…? Should you invest in Net leased commercial Property? Or Multifamily or Self-Storage? How much McDonald invests in net lease commercial real estate? TOP Net Lease CRE Investment Books – April Selection! **Additional 10% discount! What is an alternative investment real estate versus vacation home…? Our group of expert Oil Trader, Commercial Real Estate Specialist, Asset Management, and Business & Financial Analyst, can help to answer all your questions and to provide you with investment alternative and options catered to your investment strategy. 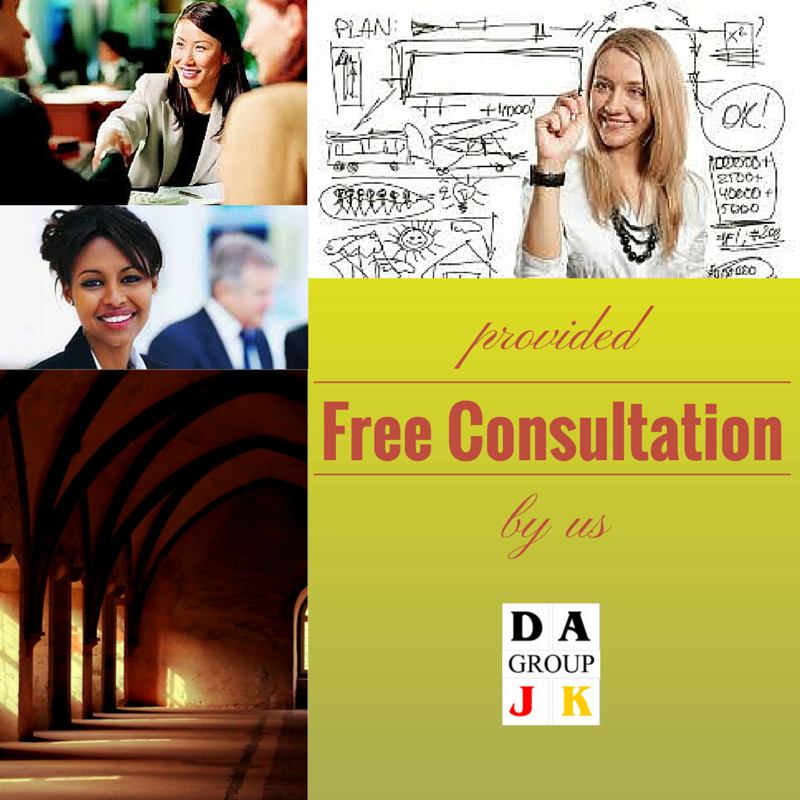 Sign-up for a free 30-minute consultation with us now! Growing, Evolving and Pushing Forward! Tips to help parents, guardians and caregivers show a child — from a preschooler to a college kid — why and how to become responsible with money. It’s never too early or too late to introduce everyday financial concepts to a young person. And, you don’t have to be a financial expert. Here are tips. Engage in regular conversations about money-related topics: That includes discussing with your child what you are doing, and why, when you manage money at home, around town or with the bank. For example, consider talking about similar products that have noticeably different prices at a store, and how you decide what is a good deal. And, you can explain that having a savings account at a bank has advantages such as income from interest, peace of mind of knowing the money will be there when you need it, and FDIC deposit insurance coverage for each customer up to at least $250,000 if the bank fails. “If you are using plastic to pay for purchases, consider explaining the difference between a debit card, which is like writing an electronic check, and a credit card, which requires the consumer to make a payment in the future,” said Luke W. Reynolds, Chief of the FDIC’s Outreach and Program Development Section. Even with automatic transfers, such as direct deposit of your pay, consider using your bank statements to show how money can move in or out of your account. And, special times of the year — like during tax time or your workplace’s “open season” for selecting health insurance — present opportunities to explain financial decisions. Consider giving an allowance as a teaching tool. It can be a positive way to teach kids, even those who are preschool age, about money management. But before you give the first allowance, help your child decide how much he or she will spend now and how much to save for future goals. Then, help your youngster see whether that target is being reached by looking at a bank statement online or a paper copy. Also talk through the tradeoffs involved with spending decisions, such as how buying one toy may mean forgoing going for the opportunity to purchase another item the child also wants. “There are many approaches to how best to structure an allowance, particularly whether to tie it to work such as household chores, so each family will need to decide what is best for them,” Reynolds added. Think twice before giving a child more money if he or she runs out of funds before the next allowance payment. That’s because part of the benefits of waiting to enjoy a bigger reward. And, for younger kids, consider paying an allowance in smaller denominations to make it easier to learn counting and saving skills. Help your kids develop a healthy skepticism of advertising and unsolicited inquiries: In general, teach children how to analyze advertisements; they need to know that “special offers” often are not the great deal they appear to be. For Grades 9-12: It’s Like … How to Speak to High School Kids About Money. Totally! A complete e-book series can be requested with our Concierge Services Form. It will be emailed to you within 24 hours. Children in this age group are naturally curious about the world around them, including money. By introducing several basic concepts — and being a good role model — you can help them gain financial skills that can last a lifetime. Learn about how money is made and used: Children can be introduced to money as soon as they learn to count. Even if you usually pay by credit or debit card, once in a while use bills and coins so your child can learn about the different values. Imaginary games, such as pretending to be at a store or restaurant, can help teach money concepts, too. Role playing with real coins can be especially advantageous because it can teach children the values of different coins, but remember that coins are a choking hazard for younger kids. The U.S. Mint has resources for parents to use at www.usmint.gov/. Learn about how money is earned: Getting paid for little chores will allow your child to learn the value of working and earning. Consider making a chart for jobs your child can perform and include the payment amount for each completed task. Start to save: Consider separating spending money from savings. Begin with clearly labeled jars or piggy banks for your child to divide up his or her cash. This will show your child that spending and saving should go hand in hand. Understand the difference between needs and wants: For your child to make good spending decisions, he or she will need to be able to identify and distinguish needs (things you cannot live without, like food and shelter) from wants (toys and candy). One game you can play involves singling out items in your house and asking your child if it’s a need or a want…and why. You can try the same thing while shopping. Borrow responsibly: Children at this age generally don’t understand the difference between buying and borrowing — they have to be taught how to be responsible for borrowed items and to return them on time. Help your child create and maintain a list of items he or she has borrowed from friends or relatives, along with the date due. Doing so will support the concepts of responsible borrowing and personal accountability. Kids in this age group are ready for meaningful lessons about saving and spending money wisely. Many also are ready to open their first savings account, if they haven’t already. Here are key concepts to teach. Think before you buy: Continue discussing with children how to separate their needs from their wishes. Also help them think how to prioritize how they use their money. Consider, for example, making a household shopping list and asking your child to number the items in the order of importance. Also use visits to the store to point out how advertisements can lead to unnecessary purchases or steer consumers toward products that are more expensive than alternatives. Try to stick to a budget: Creating a simple spending plan at this age will teach him or her to set limits on expenditures, prioritize spending choices, and avoid running out of money. Younger kids may verbally agree to a spending plan, while older kids can write it down. You will likely need to help the child keep written track of spending so both of you can monitor the progress. Consider opening a savings account with your child: Shop together for the account, and pay particular attention to the account balance needed to open the account and to maintain it without incurring fees. Also point out the interest rate, which will be expressed in advertisements as the “Annual Percentage Yield” (APY). Many banks offer special savings accounts for young people that can be opened and maintained for less money than a regular savings account. Consider reviewing with your child one of the savings account statements that shows transactions. “If you also encourage your child to keep a log of the money in the account, that could be an opportunity for you to work together on a simple math exercise and learn the value of keeping track of money,” said Luke W. Reynolds, Chief of the FDIC’s Outreach and Program Development Section. And when you’re at the bank to open or access an account, ask a customer service representative to talk about what the bank does (it takes deposits, makes loans, and so on) and that money kept in a bank is safe. Know that there are different ways to pay for things: Children can benefit from understanding where the money is coming from when people pay for purchases by writing a check or swiping a credit or debit card. Use your bank and credit card statements and ATM withdrawal receipts to explain that actual cash is either deducted from an account or it must be paid back by a certain date. 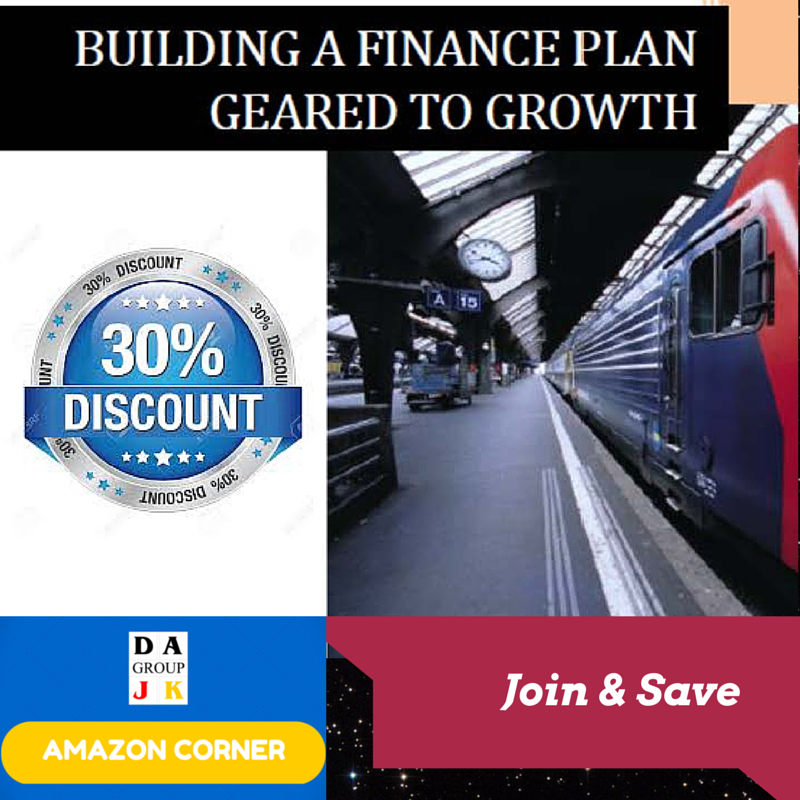 Building a Finance Plan Geared to Growth *** 30% OFF for our subscribers! To optimize your success as a small business owner, create a blueprint for financing—before you need it to drive growth. When to be definitive, and when to make a stride back and take a gander at the more extensive picture before making the important decisions. 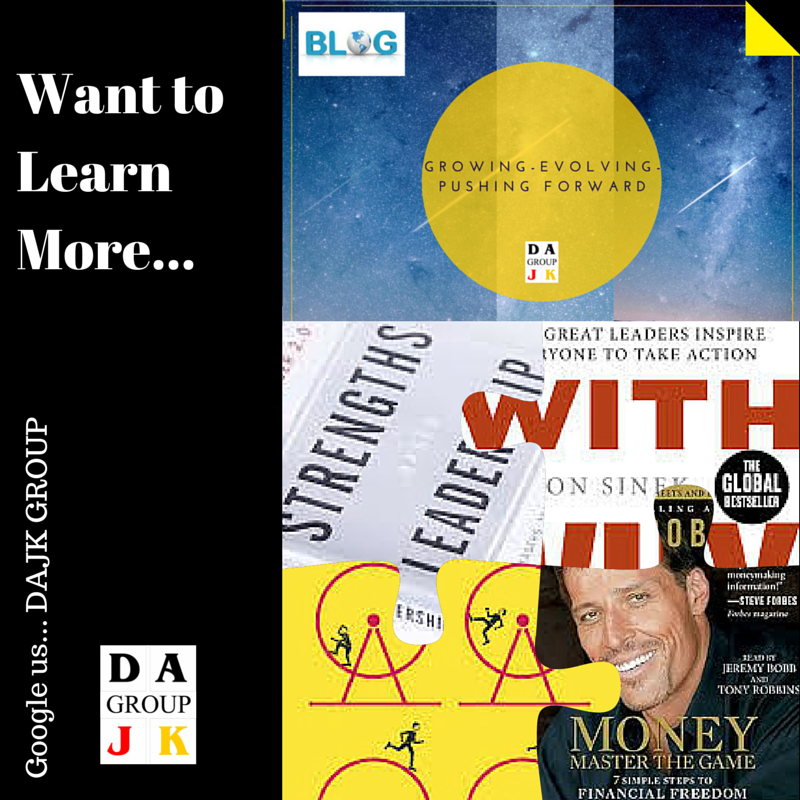 A standout amongst the most imperative aptitudes any great entrepreneur can learn is when to be definitive, and when to make a stride back and take a gander at the more extensive picture before making the important decisions. In times of turmoil, fervor, fast development, or emergency, there will be a larger number of decisions to make than regular and less time to make them. There will likewise be a practically powerful allurement to settle on these decisions as fast as could be expected under the circumstances. A great entrepreneur must be smooth, confident about his decisions, noticeable to his group and their clients, and in control of the circumstance. Notwithstanding when we think we know the greater part of the statistical data points, and have seen each edge of a given situation, reality around a circumstance can be a major astonishment. This is one of the things that makes life so energizing — exactly when we think we comprehend something, we discover some new information. This is the reason postponing judgment can be so valuable in business. There have been numerous events when I have been enticed to settle on an on the spot decision and chose to hold up until I can see the entire picture all the more plainly. These deferrals can mean missing the odd open door. There is a developing overreliance on utilizing insights as a distinct option for utilizing judgment. While raw numbers are to a great degree valuable, information investigation shouldn’t singularly drive each decision. One imperative part of decision making that is frequently disregarded is a peaceful consideration. In the wake of taking a gander at all the details, identifying with every one of the specialists and breaking down the greater part of the points, then take eventually to yourself to think things through unmistakably. Go out for a stroll, locate a shady spot, or basically sit and think for some time. Try not to defer superfluously — yet don’t surge either. Get that adjust right, and you are significantly more prone to make the wise and intelligent decision. Want to Learn more about Investment, Business, Finance and more…? 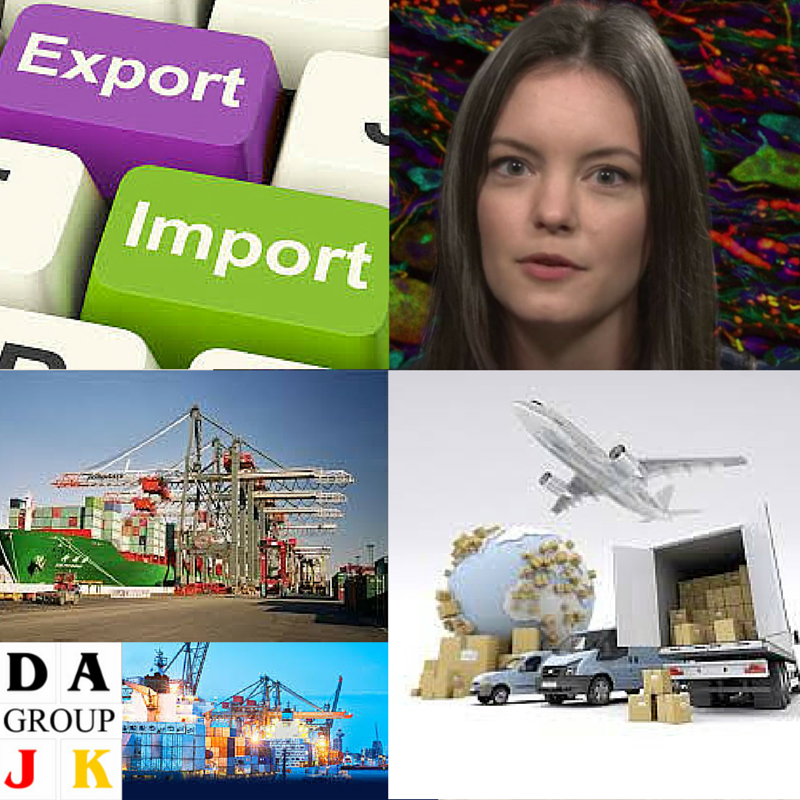 Would you like to reduce your cost of export and import business? 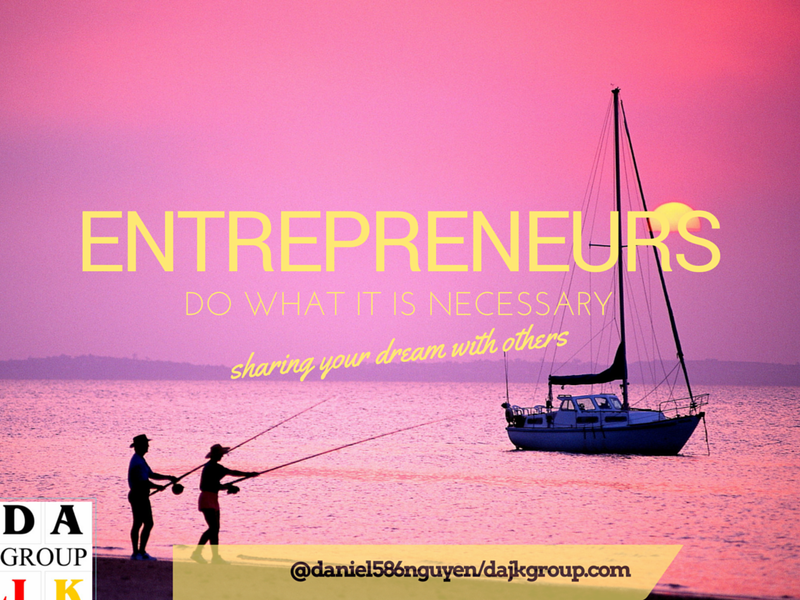 What are essential requirements for a successful entrepreneur? 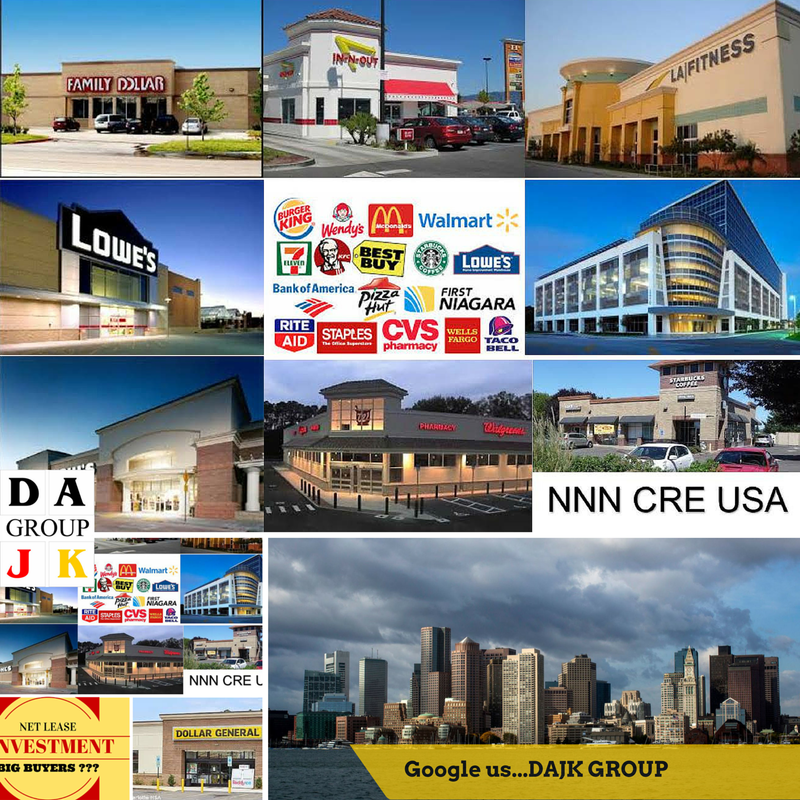 DAJK GROUP is the place where investors, business owners, and entrepreneurs can research and find useful information, insight, resources, advice, guidance, and inspiration for acquiring funds for their project, acquisition for their net lease commercial real estate, increasing their assets and running their profitable business. If the middle-class investor “saves” money by investing in mutual funds or 401K, then the wealthy and strategic investor “save” money by investing in net lease or triple net lease. How much monthly fixed income will investor receive if he invest $US 713,800? What other benefits when USA-investor invest in net lease? 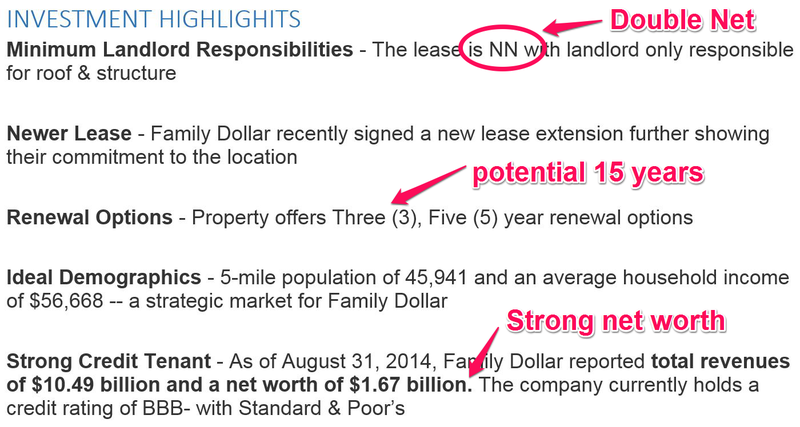 How much risk when USA-investor invest in this net lease, Family Dollars? Would you commit to saving and increasing your asset in next 12 months? Would you commit to learning the Net Lease Strategy you’ve always wanted? Would you commit to preparing both of those aforementioned objectives? What are the key data from net lease listing? You want to reduce your risk by select strong credit tenant with strong net worth $US 100+ million. Also, you make sure the Family Dollars will be a guarantee for your lease payment. How much monthly fixed income will investor receive if he invests $US 713,800? 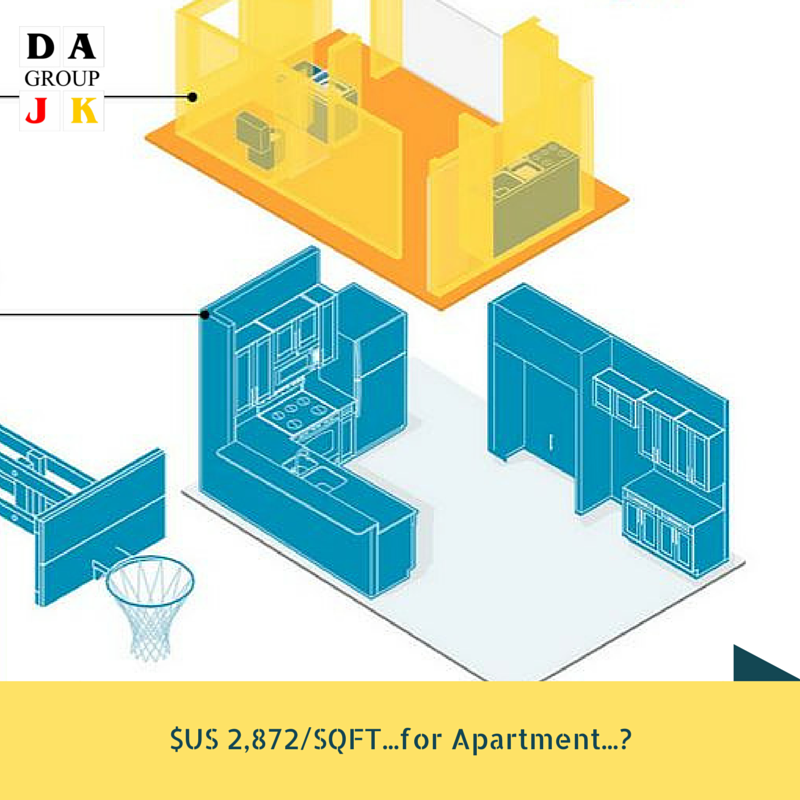 The annual return of investment, before mortgage and tax, is $US 64,600. 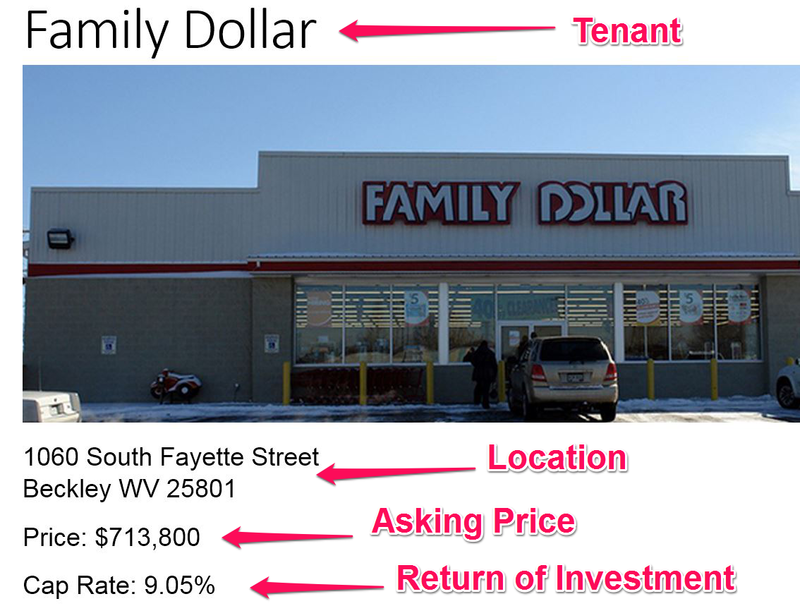 If you invest all cash in this Family Dollar, you will receive $US 5,383 a month. Please note your payment is directly from Family Dollar. Please note this is a passive income (NOT earning income) which is taxed at lower tax rate. The exact tax rate depends on individual entire financial structure. Please consult with your Certified Public Accountant. What other benefits when USA-investor invests in net lease? Depreciation & Appreciation: For USA-based investor, you may receive additional benefits such as depreciation and appreciation. Scalability: Also, you are NOT involved in daily operations of the Family Dollar neither repair & maintenance. This means you can invest simultaneously in multiple net lease properties and different locations. Therefore, your scalability is limitless. It’s only limit by how much capital you can access. Re-financeable & Transferable: You can borrow against it if you need additional cash. You can structure this net lease be transferred to your foundation or business entity at your death event. 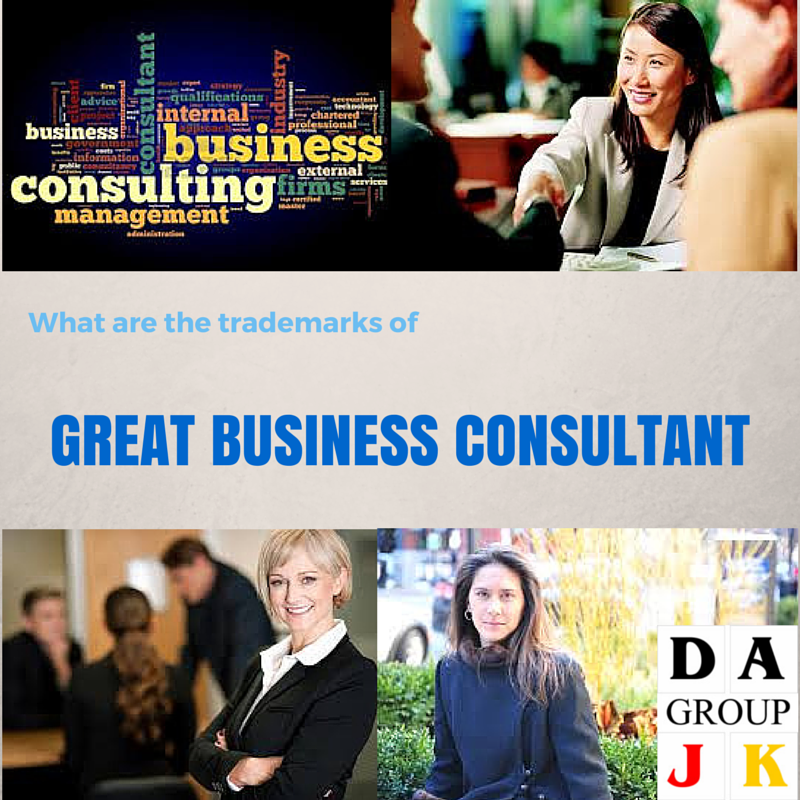 For further discussion, please contact us for our free 30-min confidential consultation. Typical Scenario: The Digital Online Business (“DOB”) generates average $US 40 million in last 3 years. Since this DOB has very little on overhead and management’s expenses, it is most likely DOB’s revenue will be taxed at the highest tax rate. Its total taxes’ bill most likely is Fifty Percent (50%) or $US 20,000,000. How can this DOB minimize his taxes’ bill legally and simultaneously increase his asset? First, the owner of DOB just allocates $US 18 million for investment in the Net Lease or Triple Net Lease commercial real estate (“NNN CRE”). Step #1: DOB purchases all cash of the 1st NNN CRE for $US 18 million. 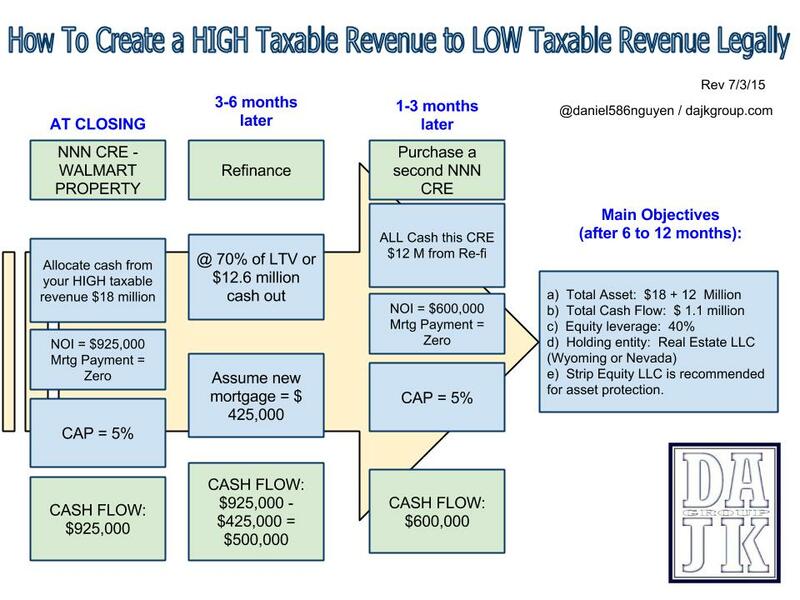 Step #2: Refinance after 3 to 6 months of closing of the 1st NNN CRE. The loan amount is approximately 70% Loan-to-value or $US 12,600,000. Please note this is a debt finance, the DOB would not pay tax on this $US 12.6 million. Step #3: DOB purchases all cash of the 2nd NNN CRE for $US 12 million from his debt finance. Please note DOB can repeat step #2 and #3 again if he wants to. After approximately 12 months, DOB creates at least 3 favorable and strategic objectives? His total taxes’ bill is reduced at least Fifty (50%) percent to $US 10 million from $US 20 million. Please note this NNN CRE strategy can work with lower initial investment. 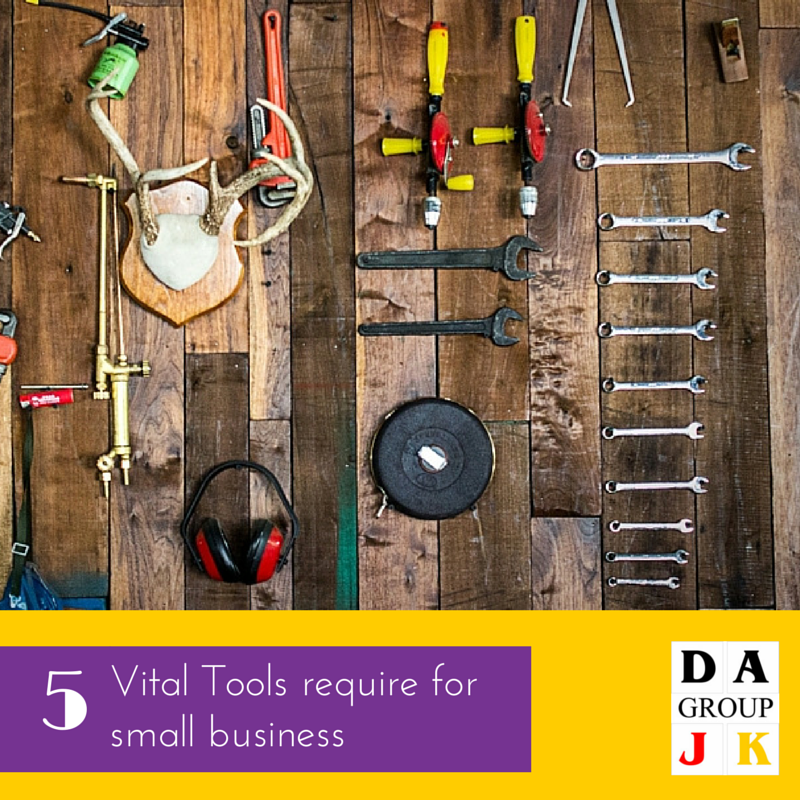 We recommend the minimum is $US 1 million for the time and efforts involving and executing these steps. There is no maximum amount; however it will be fewer selections of NNN CRE once its purchase price begins from more than $US 100 million. Therefore, this investor should anticipate a little bit longer. We would say about 24 months it is more realistic time frame. For further discussion, please sign-up for our free 30-min confidential consultation. In the event that you are in an announced disaster area and are the casualty of a calamity, you may be qualified for a low-interest rate disaster loan from the U.S. Small Business Administration (“SBA”) – regardless of the fact that you don’t claim a business. As a mortgage holder, tenant and/or individual property owner, you may apply to the SBA for a credit to help you recuperate from a calamity. Tenants and mortgage holders alike may get up to $40,000 to repair or supplant apparel, furniture, autos or apparatuses harmed or decimated in the calamity. Mortgage holders may request up to $200,000 to repair or supplant their essential home to its pre-disaster condition. The loan may not be utilized to overhaul homes or make increments unless as needed by neighborhood building authority/code. Loans may be expanded up to 20 percent of the aggregate sum of calamity harm to land, as checked by SBA, to make improvements that diminish the danger of property harm by future disasters of the same kind. Secondary homes or vacation properties are not qualified for these loans. 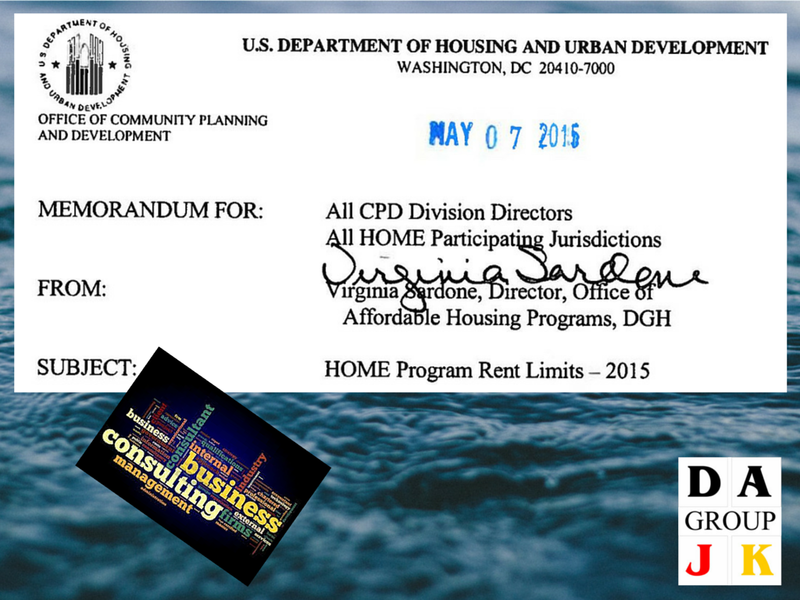 Then again, qualified rental investment properties may be qualified for help under our business loan program. Any proceeds from insurance coverage on your property or home will be deducted from the total harm to the property to determine the advance sum you are qualified for. SBA is not allowed to duplicate any advantages or benefits. For candidates not able to get credit somewhere else the interest rate will not surpass 4 percent. For the applicants who can acquire credit somewhere else, the interest rate will not surpass 8 percent. SBA figures out if a candidate has credit accessible somewhere else. SBA offers loans with long-term repayments as a rule up to 30 years. Terms are determined on a case-by-case premise, based upon every borrower’s capacity to reimburse. For extra information, brochure, emergency essential, emergency preparedness, emergency plan for business, parent, kids, commuters, elders, disability please contact us. The amount SBA will lend depends on the cost of repairing or replacing your home and/or personal property, minus any insurance settlements or grants. SBA will send an inspector to estimate the cost of your damage once you have completed and returned your loan application. Can the SBA refinance my mortgage? In some cases, SBA can refinance all or part of a previous mortgage when the applicant does not have credit available elsewhere, has suffered substantial disaster damage not covered by insurance, and intends to repair the damage. SBA considers refinancing when processing each application. How soon before I know I have been approved? The SBA disaster assistance program helps with long-term, low-interest rebuilding and repair of damaged property, unlike immediate emergency relief provided by relief organizations. To make a loan, we must know the repair cost, be assured that you can repay the loan, and take reasonable safeguards to make sure the loan is repaid. The sooner you return the completed loan application, the sooner SBA can process the application. SBA tries to make a decision on each application within 14 days. Make sure the application is complete, since missing information is a major cause for delays. What information must I submit for a home and/or personal property loan? You must submit the completed loan application and a signed and dated IRS form 8821 giving permission for the IRS to provide SBA your tax return information. Is collateral required for these loans? Loans over $14,000 must be secured to the extent possible. The SBA will not decline a loan if you do not have enough collateral, but will ask for whatever collateral is available. That usually consists of a first or second mortgage on the damaged real estate. Should I wait for my insurance settlement before I file my loan application? No, do not miss the filing deadline by waiting for an insurance settlement. Final insurance information can be added after a settlement is made. SBA can approve a loan for the total replacement cost up to our lending limits. Once your insurance settles, if there is a duplication of benefits, we will apply those funds to the balance of your disaster loan. I’m a farmer, and my barns, fence, and some of my crops were damaged, as well as my home. Can I apply to SBA for assistance? You may apply for an SBA disaster loan to cover the damage to your home and its contents only. SBA cannot cover agriculture losses. Contact the U.S. Department of Agriculture for recovery assistance for your farm or contact us. In Presidentially declared disasters, residents and business owners can begin the disaster application process by registering online with the Government Agency, or by calling us. For more information about SBA disaster assistance plus disaster preparedness for individuals and businesses please contact us. 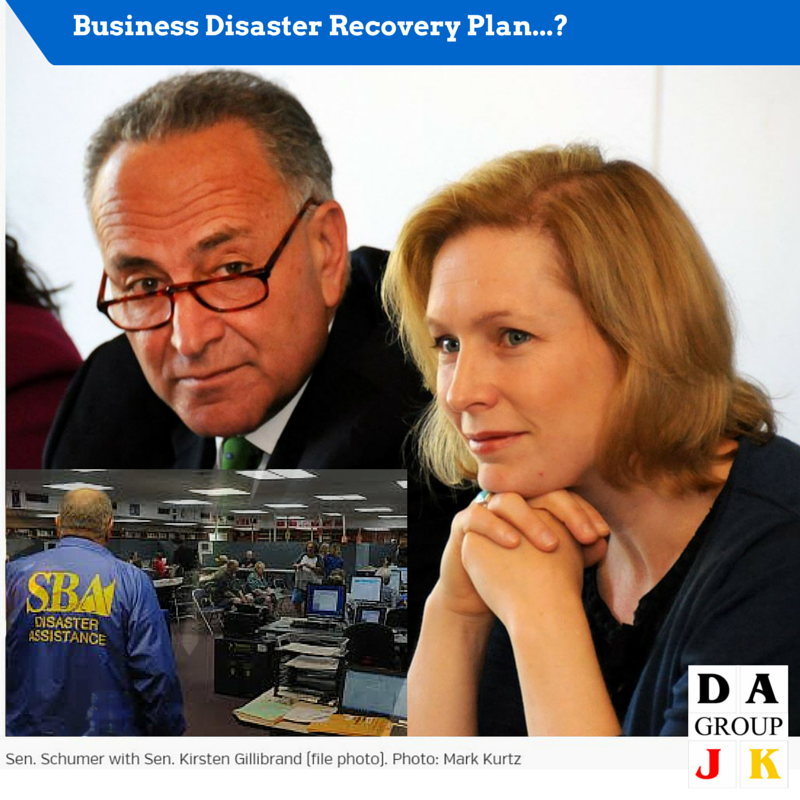 For more information, please contact us to request a free sample emergency plans, business preparedness checklists, and templates providing detailed business continuity and preparedness information. Additional 10% OFF for All New Buyers! Our recent study showing creative investors especially net lease commercial real estate have increased using their art collections as collateral loan. The question is WHY? There are more willingness banks and smaller art lenders are aggressively offering loan secured by art collector. 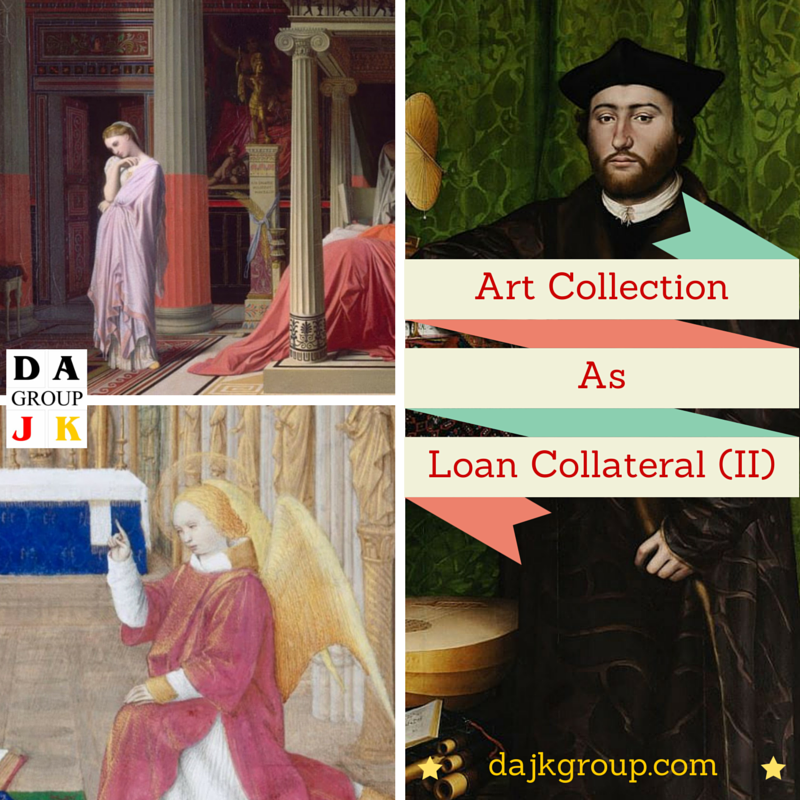 For art collector (borrower), it depends on what type of loan, the loan-to-value (LTV), annual interest rate and terms. Recourse loan where art is required as collateral for the loan but the borrower also has to provide a personal guarantee of payment. That means if the borrower defaults and the bank can’t recover the full amount of the loan by selling the art, it can make a claim on the borrower’s other assets. Non-recourse loan where it does not require borrower’s personal guarantee. The artwork is the only asset that is the security for the loan. Because of the low risk associates with the recourse loan, lender offer much lower rates. It’s also a part of an overall relationship with a wealthy client. Borrowers may be able to get rates as low as prime plus 2% or 3%. Conversely, the non-recourse loan, annual interest rates vary largely but typically range from prime plus 6% to 13%. The minimum loan is $US 5 million for an art-secured loan. Since loans typically are around 50% of the appraised value of the art, the borrower’s collection would need to be worth around $10 million or more. Also the minimum value of each piece is $200,000. These are typical requirements for these art-loans. Borrower requires proof of authenticity such as purchase document, exhibition history, sale history and inclusion in a catalog. Borrowers also need to prove that they own the art outright, with no possibility of anyone else claiming it in situations like divorce or a disputed inheritance. In addition, certain lender prefer a certain type of art collections. They make better collateral than other. For instance, some lender prefers artworks from ancient civilization; other lender prefers artworks between 19th century impressionist painting and postwar or contemporary art. CONTACT US… Collectors interested in arranging financing should contact us for free consultation. We will assist to identify the borrowing need, determine what type of financing makes the most sense, and facilitate the appropriate lender. Please note minimum appraisal report is at $US 5 million. There is no maximum amount. Art collectors have high value inaccessible in their art collections. If they need to access of this value, they do not have to sell their art to create liquidity – Borrow. They can borrow funds and retain possession for their art. There are big advantages to borrowing – avoiding selling cost, capital gain and taxes. It could be up to 65+ percent. These combination can make it VERY expensive to sell. What is the alternative to access its liquidity? Borrow. For example: A collector sells his art for $US 10 million. Assuming selling costs of 20 percent (20 percent of $US 10 million = $2 million) and an original cost of $US 1,000,000 for the art. Funds realizes a before-tax profit: $US 7 million. Net to collector: $US 4.2 million (this profit is subject to capital gains tax. Assuming a rate of 40 percent (28 percent federal plus 12 percent state), the collector pays $2.8 million in capital gains tax, and nets $4.2 million. By selling during his lifetime, the collector pays 2 levels of tax: capital gains and estate. By borrowing to create liquidity, the collector can keep the art during his lifetime and have his estate benefit from a step-up in tax basis. This enables collectors to pay just one level (estate tax) rather than two. In this example, the collector could borrow as much as $US 5 million (up to half the art’s value) and keep his art. Art collector would be responsible for debt service on the loan, but he would also benefit from any appreciation on his art. People also borrow against their art to make charitable contributions, pay medical expenses, and fund divorce settlements. An art-based loan is a low-cost option for art collectors in need of cash flow who can enjoy their art while making scheduled payments. In these uncertain economic times, art collectors also borrow to avoid the risk of having their art “bought in” (or “burned”) at auction, which makes it difficult to sell for years to come. Many arrange lines of credit and term loans to invest more art. Some whose wealth is concentrated in art borrow funds to invest in other asset classes, such as stocks, bonds, real estate, oil, gas, private equity, and hedge funds, thereby diversifying their holdings. Consult your financial adviser, accountant, attorney, or estate planner while making these decisions. 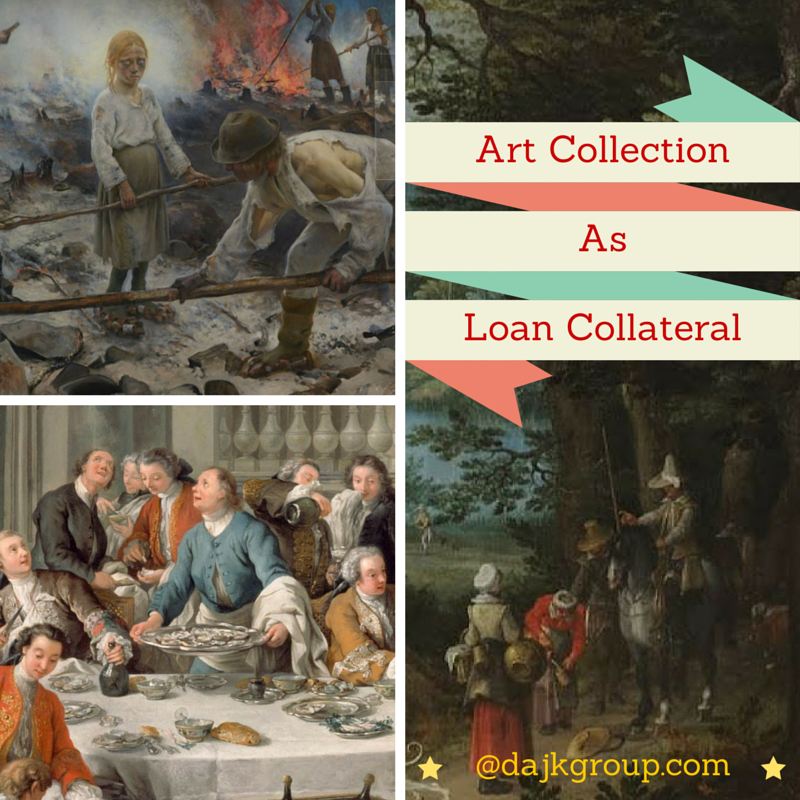 Does art collector want the flexibility of a line of credit or a term loan of 3-10 years? Does art collector want a six-month loan to fund short-term liquidity needs? Or an advance against art that art collector plans to sell later this year? CONTACT US… Collectors interested in arranging financing should contact us for free consultation. We will assist to identify the borrowing need, determine what type of financing makes the most sense, and facilitate the appropriate lender. Please note minimum appraisal report is at $US 5 million.